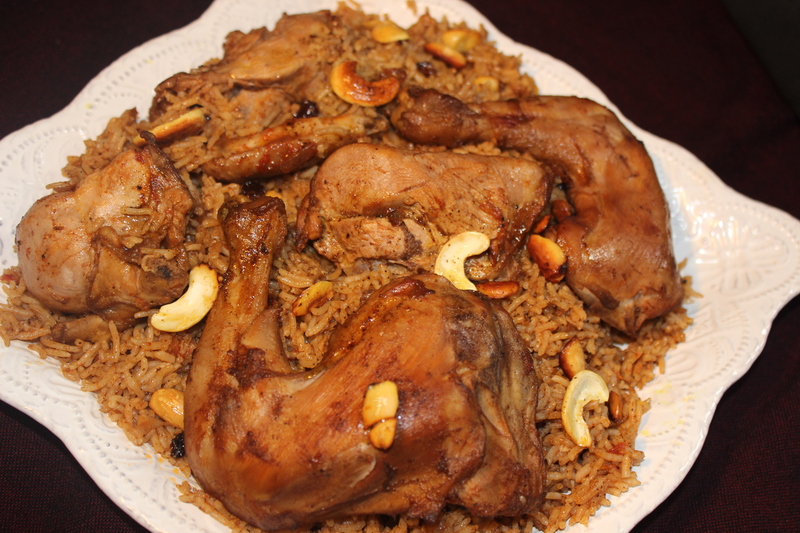 Kabsa- the national dish of Saudi Arabia is probably the most popular rice praparation through out Arab countries , believed to have originated in Yemen. Though known Kabsa in Saudi , it is otherwise known as Makbous/ Machbous/ Majbous in the Gulf region ( Iran , Iraq , Qatar , Kuwait , Jordan , UAE ) . Just like the variation in name , the taste differs from region to region mailny because of the uses of spices . The technique of cooking varies too .Though look alike our very own Biriyani , it does differ in taste !! I have seen many recipes , that did not make Kabsa at all !! Those are more like biriyani . Kabsa is milder in spices and the spices that are used most is Black pepper , all spice , clove , cinnamon , cardamom , saffron , nutmeg and dried lemon powder or the whole dried lemon ,called loomi . The spices are grounded together and named Baharat !! Nuts ( specially almond and pine nuts ) and dried fruits are used as garnish . In some part of Middle East , cumin and coriander powder is also used in the baharat , but the amount is too little . And not to forget tomato paste and puree is one of the most important ingredients of Kabsa !!! I have tried to make it authentic way !! Hope you’d like it too. As I said earlier , the technique of cooking kabsa varies . “Meat for kabsa can be cooked in various ways. A popular way of preparing meat is called mandi. This is an ancient technique, whereby meat is barbecued in a deep hole in the ground that is covered while the meat cooks. Another way of preparing and serving meat for kabsa is mathbi, where seasoned meat is grilled on flat stones that are placed on top of burning embers. A third technique, madghūt, involves cooking the meat in a Pressure cooker” ( Wikipedia). If you can’t find loomi or dried lemon , please substitute it with 1 tbl spoon orange/ malta zest . Orange zest gives a wonderful aroma and adds flavor as well . 1. Soak the rice in water for at least 45 minutes before cooking . 2. Heat oil and add the sliced onion . Fry them until brown . Don’t over brown it . Just light golden brown . Now add the chicken pieces and keep frying . Add the chopped tomato and tomato paste . Add the Kabsa spice . Now add the grated garlic . Mix well . Add the orange zest , salt .Now add 4 and 1/2 ( half) cup of water or chicken stock to the chicken. Add a chicken cube if using water and let it cook for 20 minutes with lid on . 3. After 20 minutes , remove the chicken pieces from the gravy . Now after 20 minutes there should be around 4 cups of water by now . This is something you have to eye ball . Add the rice . For per cup of rice around 2 cups of water is needed . So there must be 4 cups of water in the pot . So if you think you need a little more water to cook the rice properly , you can add but don’t use more than 4 cups of water . That would be too much ending in mushy kabsa . Cover the lid and cook the rice like pulao until the water got absorbed . Don’t stir until the water dries out . When the water dried out just stir with light hand without breaking the rice . Now keep it on low flame or Dum . What I do , I use double boiler method , where I put the pot of rice on the same sized vessel , filled with water . The steam will work as the “DUm”. 4. In the mean time broil the chicken pieces in the preheated oven for 10 minutes at 400 FH . If not using oven , just fry them in little butter in a grill or frying pan . 6. In another skillet fry the dried nuts ( almonds , cashew , raisins ) in butter . Don’t burn them . try to fry them separately . 7. Transfer the rice to a serving plate . Place the chicken pieces on top and serve with tomato chutney like thing , named “Dakkous” . For those who canot eye ball the water , this is for you . For this you need to boil the chicken pieces with black pepper , bay leaf and few cloves . Remove the chicken pieces from the stock and starin and reserve the stock to use in the cooking . Now follow the # 1 procedure mentioned above except don’t add 4 and half cups of water . In this case add 4 cups of water ( chicken stock we got while boiling the chicken) to 2 cups of rice . Just before adding the stock , remove the chicken pieces from the gravy and broil it or fry it as it is mentioned above procedure . 1. You can process dried lemon at home . Boil the lemon in salt water then dry it in sun heat . 2. If you don’t find all spice , omit . All spice is used in Yemeni version of Kabsa and not an essential ingredient in Saudi Kabsa . 3. Please Try to use a non stick utensil for cooking in order to avoid got stuck on the bottom . Romanticism is in the blood of Bangali !! Romantic Bangalis love rain and there is hardly any Bangali who doesn’t crave for khichuri in a pouring rainy day !! Yes , Khichuri and rain is almost synonymous to the romantic Bangali adding a unique dimension to the romanticism they possess !!! There are so many preparations of khichuri .. Some are spicy , some are mild , some are mushy while some have biriyani like grandeur . Among all of them , the most popular may be the “Bhuna Khichuri” . Traditionally bhuna khichuri is made with aromatic rice and moong daal ( yellow peas ) . But here in this recipe I used 5 types of different daals to make it more flavorful . Before we proceed , we have to keep in mind there are some preparations before you make mind blowing bhuna khichuri . * Wash and soak Chaana daal , mattar daal and toor daal . Don’t add moong or mussor in it . Now after minimum 2 hours of soaking half boil it with little water . * Soak moong daal for 30 minutes . Don’t soak musoor daal . Just add the musoor daal in the moong daal when you are ready to wash the moong daal after at least 30 minutes of soaking . Musoor daal boils sooner than moong so you don’t need to pre soak it . It’s better to fry the moong daal without oil for few minutes before soaking in water . If you have time do this , it gives the best flavor from the moong daal . Drain the water from daal. * Wash the rice and drain out the water . 1. Heat oil and ghee together . Add the bayleves , cardamom and cinnamon . Add the sliced onion and fry for a while . Add the daal and rice . Fry . The little tips is , the more you fry and stir, the more flavorful khichuri is . Add the ginger-garlic paste , red chili , turmeric powder and salt . Stir and fry . Add 5 cups of warm water . For per 1 cup of mixed chaal-daal , you should take 2 cups of water . I love little soft khichuri so I added extra little water . 3. When the water dries out , add whole green chilies and stir carefully only once from bottom to top and side by side without breaking the rice . Don’t stir vigorously !! Now put the khichuri on “Dum” . For that I always use double boiler or bain marie method.It works great for me. Put your khichuri vessel over another same size vessel, filled with water. Place it on the stove..Your khichuri will get the steam and you will be surprised at the beautiful, moisture free texture of Khichuri . Serve hot with ilish mach , begun bhaja , beef bhuna or even only dim bhaji ( egg omlette). Don’t forget the pickles and onion , lemon . Bon a petit !!! 1: For the color of Khichuri , many complains that they don’t get that bright yellow color . If they put small amount of turmeric , color won’t come and if they put little extra , the khichuri tastes bitter . The secret is the turmeric gets it color brighter while frying the rice and daal . Don’t put the turmeric in the oil, it may get burnt and make the khichuri tastes bitter and look darker.Always add turmeric after you added the rice and daal . Now the more you fry , the more flavorful is the khichuri and more beautiful yellow color it gets . 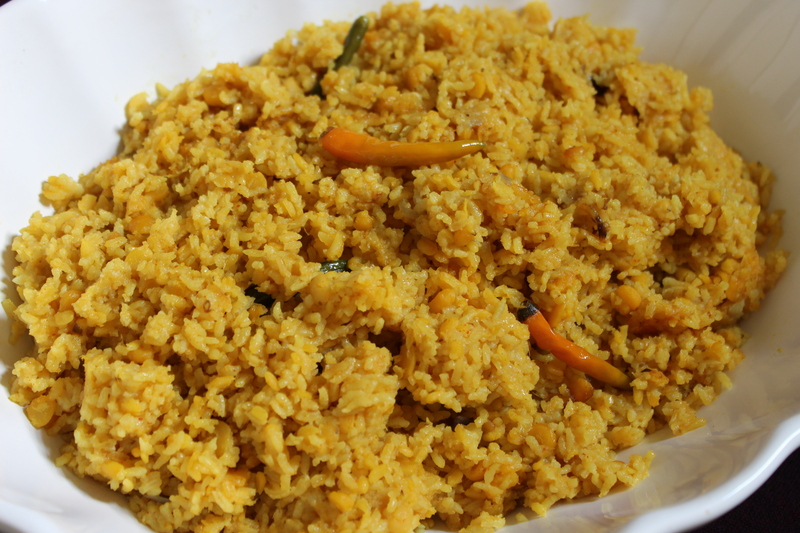 Daddojanam refers to tempered spiced curd rice – a comforting South Indian recipe . When rice is replaced with flattened rice or poha/ chira , it is called Atakula daddojanam . I am on diet since couple of days!! So looking for healthy but yummy diet friendly recipes !!! Just got an awesome idea .. This is a South Indian speciality “Atakula Daddojanam” or Savory Dahi- flattened rice ( chira ) !!! Inspired by my Indian blogger friend Aruna Panangapalli of Aharam. Thank u Aruna !! I just modified a little !! A great recipe if you are looking for low-cal but healthy breakfast options !!! This is not more than 280 cal !!! 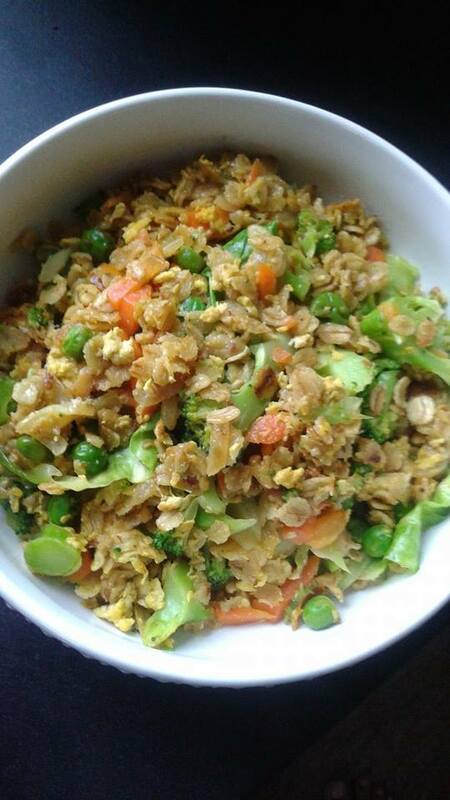 If you are looking for more healthy option , you can try this with oats too . I’ll mention the process at the end of the recipe too . 1. Wash and saok the chira in water for few minutes , until soft , around 5 minutes . Drain out the water . 2. Beat the yogurt and mix with chira . Add some salt , not too much . 3. Put oil in a frypan and add musturd seed , before the oil is too hot . Otherwise the seeds will be burnt and will taste bitter . Now add the dried chilies , chana daal , peanuts . fry a little until the daal and peanuts are brown and crispy . Add the ginger . Add few curry pattas and pour the tempering over the Dahi-chira and serve !! 1. You can use oats instead of chira too . For that cook oats with water until it absorbs all the water . Let it come to room temperature , then mix with yogurt and temper like the process above. I have two versions of white khichuri . One has Polau like texture , while other one is mushy !! Today’s post is about the mushy white khichuri !! Less spice and tastes awesome . 1. Boil 7 cup of water with the cinnamon , cardamoms , cloves and black pepper . Reduce it to 6 cups . Strain the water . It will be added in the khichuri. 2. Soak the chaal/ rice and daal for at least half n hour . Drain out the water . 3. Heat Oil . Add bayleaves and chopped onion . Fry until transparent . Fry with chopped potatoes and carrots . Add the rice and daals . Add the ginger paste . Fry for a while . Add the 6 cups of boiling water , we boiled with the garam masala . Add salt. 4. Add some green chilies . Once the water dries out add 2 tbl spoon of ghee over the khichuri . Since it is soft khichuri , you need not put it on “dom” . It will look little mushy . Iftar in Ramadan in Bangladesh is synonymous with Chaana bhuna !!! This is the must item in iftar !!! Here you go with the classic chana bhuna recipe !!! 1. Soak the black chick pea for at least 5/6 hours . 2. Boil the chickpeas and potato . Drain out the water . Don’t add any salt . Now wash the chickpeas in freash water . Drain well . 3. Heat oil . Temper with dried chilies . Add the sliced onion . Fry until soft . Add the ginger paste , garlic paste . Add little water , then add turmeric, chili powder , garam masala powder . Fry well . add the boiled potato , cut in cubes . Add the chickpeas . Fry for a while . Add salt and water . Add the tamarind juice and split green chilies . Don’t add too much water . Around Half a cup . 4. When the water dries out stir continuously so than it’s not burnt. Add the cumin powder and chaat masala . Mix with lemon zest . 5. Garnish with julian cut ginger , fried red chilies and sliced onion . Interestingly , In Lucknow there is nothing like Biriyani !!! Biriyani is synonymous with “Pulao”, in Luknow , this is pulao !!!! But in other parts of India , Pulao is something where rice and meat are cooked together , at the same time , in the same vessel , lacking the grandeur and glory of that of “Biriyani”. So in present days , the term “Biriyani” is being included or more specifically intruded in the culinary dictionary of Lucknow so as not to confuse the Lucknowi delicacy with that of the “Pulao” pf other regions !!! Luknow !!! The historical city of secrets and mysteries !!! The Luknowi cuisins , though a variant of Mughlai cuisins ,are so subtle in taste but so flavorful , so refined yet so elegant . Lots of secret ingredients made the whole gharana mysterious to others . The Sub-continent owe a lot to the dastarkhan of the Nawabs , no doubt !!! My studies about Luknowi/ Awadhi cuisine found a great influence of the gharana on many cuisines of Bangladesh , may be because of the fact ,the last Nawab of Awadh , Wajed Ali Khan was being exiled in Bengal !!!!! He did not forget to bring the main chefs of his kitchen with him !!! No wonder , the Nawabs were the greatest foodie ever !!! 1. The biriyani is the pakki biriyani , that is the meat is cooked before and the stock or Yakhni is kept aside . No powdered garam masala , no mint or cilantro , no tomato . Keora or screw pinewater along with saffron is essential . 2. The rice is cooked in the Yakhni or stock with ghee . 3. The layering of meat and rice and then the pot is sealed with a flour dough and will be kept in steam , the process known as “Dumpukht” . Here you go with Luknowi Mutton biriyani !!! Though fine quality basmati rice is supposed to be used in the recipe , I preferred our very own Kalijeera or chinigura chaal for it’s unique and distinct flavor !!! I have never found such an aromatic varieties of rice anywhere !! 1. Soak rice in water . In a cheese cloth put everything mentioned for stock, except salt. Now tie up the cloth like a parcel and put it in a pot filled with 14 cups of Warm water. Put the mutton pieces don’t add salt now . Let it boil and add the salt just 5 minutes before you turn off the stove , till the mutton are three-fourths done .Reduce the stock to 8 cups. Don’t take out the masala bundle while doing so. 2. Now , the gravy part . Blend the yogurt with fried onion or bereshta . Heat ghee , fry the whole garam masala for a while .Add ginger-garlic paste and red chili powder. Add the blended yogurt and cook for a while . Add the mutton , keep cooking on a medium low flame . Now add 2 cups of stock from the prepared stock . Reserve remaining 6 cups for the rice . Check the salt , add a little bit , since the stock has the salt too .Add the potatoes chunk . Careful , the potatoes must not be fully done . Just 70 % or so otherwise it will be mashed in the biriyani while the biriyani will be on “Dam” .When the gravy reduced a bit , add the cream or milk, mace and nutmeg powder and handful of whole green chilies . There must be 1 cup of gravy in the mutton . 3. Put ghee in a pot . Drain out the water from the rice and add into the ghee . Add 6 cups of stock . Add the cinnamon stick. black cardamom , star anise . Add salt, but careful , the stock has salt too . So Adjust the salt . Cover the lid and cook on medium flame . Don’t stir. When the water is completely dried out , turn off the stove . The rice would look like 80% done. For “Dum” , I always follow double boiler method . Put your biriyani pot over another same sized pot filled with water . Turn on the stove on medium flame. The steam will do the wonder . Those who will put it in the oven , cover the lid tightly or wrap with double layer of aluminium foil .In a bake mode , keep it in the preheated oven for 20/ 25 minutes at 350 FH. Serve hot with kabab and salad or raita . Boil the keema with 1 tea spoon ginger-garlic paste , little soy sauce , 2 cardamoms , 1 small cinnamon stick and few black peppers . Dry out the water . Now in a pan , heat oil and add the keema , fry , add some chopped onions and green chilies . At the end sprinkle a little garam masala powder . For the garam masala paste , take 1 black cardamom , 4 green cardamoms , 1 small cinnamon , 1 tea spoon fennel , 1 tea spoon cumin , 4 cloves , 4/5 black pepper , 1 tea spoon mace and 1/2 tea spoon nutmeg . 1. Boil the potatoes 70% with skin on . It must not be fully boiled . Noe remove the skin and cut in halves crosswise . Scoop out the potaotes from the middle keeping the borders intact with the help of a knife . Now stuff with keema . Don’t stuff loosely or else the keema will come out after adding them in the gravy . 2. Heat ghee and add the potatoes . Fry a bit . Remove from the ghee . 3. Blend yogurt with bereshta . Now add ginger-garlic paste to the ghee . Fry very well , so that the raw smell goes away . Now add chili powder and salt. Fry well adding water little by little . When the “Koshano” is over add the garam masala paste , cook a little and add blended yogurt . Cook . Add the stuffed potatoes . Add sugar and whole , cracked green chilies . When the gravy is reduced a bit , sprinkle keora water . Don’t dry out the gravy . We need the gravy for the biriyani . Now remove the potatoes from the gravy and keep aside . 4. Wash the rice and drain out the water . Heat ghee and add whole garam masalas . Add the ginger paste, salt and rice . Add the gravy , which is about 3/4 th cup . Now add 6 cups of hot water and cook with lid on on medium flame . When the water is dried out , add the saffron milk and generous amount of keora , green chilies and keep it on “dom” or low heat for about half n hour . I use double boiler method . I take the same size pot , filled with water and place the biriyani pot over it . The steam making the “Dom” stuff !! 5. When you are serving , spread 1 layer of rice and put some potatoes over it . Spread another layer of rice and put the potatoes over it . 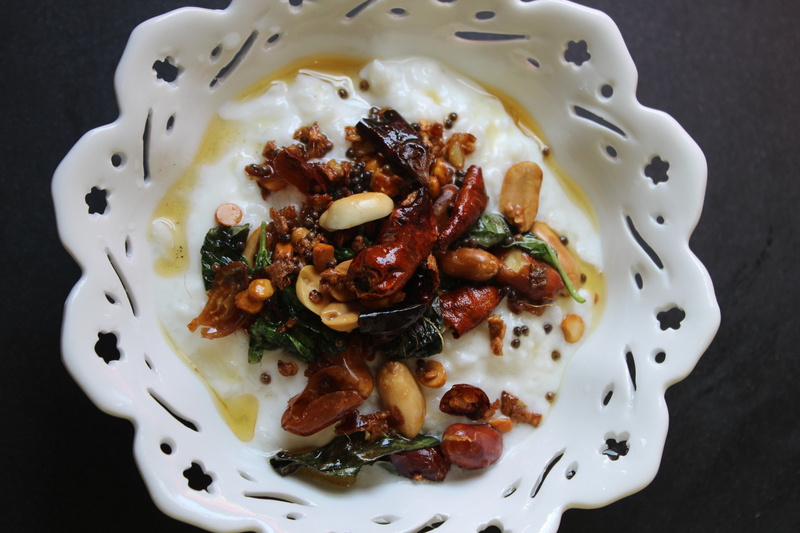 You can garnish with chopped almond , bereshta and fried raisins or kishmish too .